It’s difficult to imagine not having a website for a local business of any kind. Every single business expecting to sell goods or services today needs to have a website. Being a local plumber who inherits their father’s business and clients is no longer enough. Word of mouth referrals may keep you busy for a while, but if you want a consistent flow of new business your website should be more than just an online brochure. It should be a marketing tool which helps get you more business. Search Engines – In order for your website to be seen by anyone, you need to be registered on the most popular search engines. This means you go to Google, Yelp, Bing, and others to register. You’ll create a profile page with your updated information, your website, and directions to your business if you have a showroom or office. When somebody needs a toilet fixed or their water heater went out, they go online to find a plumber using a search, which you want to be at the top of. Sure, you hope they call you, but if it’s after hours, or they can’t reach you on the phone, the link to your website lets them check you out. Not coming up on the search means no chance at seeing your site or find your business. Become the local expert – Having promotional text and logos on your site saying how great you are is OK, but no longer optimal. If all you do is sell your plumbing services, people won’t see you as anything different from the competition. Your company needs to standout from every other plumbing business. Use your website to showcase your expertise and willingness to serve your community by sharing it. Become the local plumbing authority by educating your site visitors with plumbing DIY tutorials, FAQs, and videos. Your name will be on their minds when a plumbing job needs to be done. Posting regular content – Make your site the hub of blogs, videos, and commentaries. You can get more people on your site by linking your content to your social media platforms. Use a calendar to schedule regular posts, perhaps begin with a few posts each month. When you get the hang of it, try to do at least one each week. Depending on the size of your business and your community, you can gauge what works and what you can keep up with. The goal is to develop followers who will engage with you and spread the word. Updated information and formatting – You might wish your site was a “set it and forget it” tool, but it isn’t. You need to regularly update information and freshen formatting. Make sure your site looks like “somebody’s home.” Inactive appearing sites don’t get a lot of traffic, which will work against bringing in business. Home Pro Digital knows how to make your website look great and how to incorporate features that draw customers and elevate your brand. 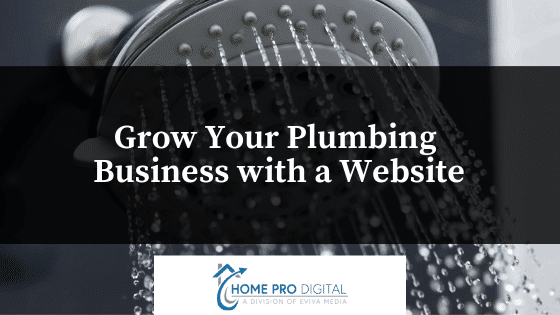 Call us to see how we might help you create or update your plumbing business website today. This free (and useful) planning sheet will help you schedule out your posts and figure out when your audience is online.